Puglia features great country estates, “Masserie” from the 16th and 17th century, many have been refurbished as luxury hotels. Staying in a masseria is a memorable and unique experience; one of the most beautiful is Masseria Torre Coccaro with its spa and golf course. You may find another beautiful golf course at “Borgo Egnazia” where the Justin Timberlake-Jessica Biel wedding was staged. 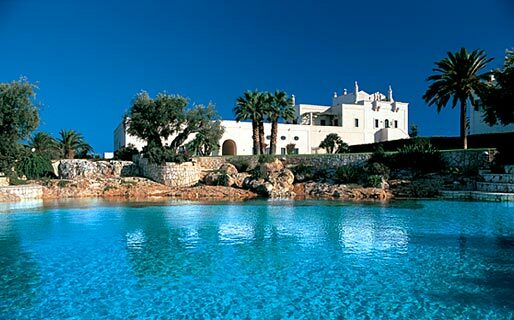 “Borgobianco” (photo above) in Polignano a Mare features a fantastic Spa in a rural setting. If You are looking for homey charme try the fantastic Ostuni masserias: Boezio, Cervarolo, La Rascina or Salinola. Staying in Ostuni, if you prefer to stay in a former medieval monastery You may choose “La Sommita’” or “La Terra”. For modern 4 star comfort we recommend the “Ostuni Palace” , “Hotel Novecento”, “Monte Sarago” or Masseria Santa Lucia by the sea. If You are visiting Alberobello and want to sleep in a magical “Trullo” , try the cone-shaped room at “Le Alcove”. In central Lecce we like Hotel Risorgimento, Santa Chiara, and Hotel Patria. You may also try some luxury B&B like Palazzo Persone’, Roof Barocco Suite, Mantatelure' and Palazzo Bernardini. These are small intimate structure with few rooms and impeccable style and taste. While in Lecce you may also learn the secrets of Pugliese cuisine with our unique cooking courses. Our goal is making your vacation truly (trulli) memorable.